Bicycle Design: An Illustrated History fills in the gaps on how the awesomeness that is the bicycle came to be. Up-front confession: this book was not featured (so far as we know) at Interbike! However, it DOES chronicle pretty much all the innovations throughout bicycling history, so rest assured that the predecessors to many of the “new” things there are mentioned in it! Bicycle Design: An Illustrated History is by Tony Hadland and Hans-Erhard Lessing, and in the authors’ words seeks to fill the neglected gap addressing the technical aspects of the history of the bicycle. It starts out with… well, actually it starts out with ice skating and wheelbarrows… but it quickly moves on to velocipedes and draisines, the predecessors of the bicycle. Another confession: I haven’t read the whole thing. I did read all the bits about velocipedes and high-wheel bikes and wire wheels and the development of the safety bicycle (aka a bike having 2 wheels of the same size), but after that concluded that this wasn’t really meant to be read straight through – and yeah, it took me a bit longer to figure that out than it might take most people, but what can I say… I’m a bit of a bike nerd! Apparently we should call these draisines! So after some deliberation, I’d consider this more of a reference book: the next time you wonder, “when WAS the first bamboo frame made?” rest assured that this is the place you can find that answer! (page 178: 1890’s, patented in 1896. Calfee wasn’t exactly the first!). The first 5 chapters of the book detail the history up to the invention of the diamond-frame steel bicycle. After that point, it diverges into chapters on different aspects of bikes, such as transmission, braking, and lighting. It also – at the end – includes specific sections on “racing” bicycles and mountain bikes, folding bikes, and military bikes (an interesting chapter!). Overall this is a very informative book, and I say kudos should go to the authors for assembling all of the information in a scholarly fashion, complete with TONS of references at the back (if anyone out there needs to write a term paper on anything about bicycles, this should be your starting point!). My one minor (major?) complaint about it is that it reminds me of several of my history classes in high school. How so? No, not because I fell asleep… I like history, and this book is written pretty well, so I didn’t do that during either high school or while reading this! It’s because in high school I had several years of history classes where we spent a ton of time on something early in the semester… and then gradually less and less time per topic, until by the end we rushed through the 1960’s on in only a couple weeks (I don’t think I had a history class that ever made it to the decade we were in!). Bicycle Design reminds me of this: it spends a lot of time on early development, but we get to the end and there are a scant 10 pages on mountain bikes. Two paragraphs on disc brakes. Two pages on suspension. Etc. etc. Yes, these are relatively recent in the scheme of things – but they’re BIG things right now, they involve some pretty neat increases in bicycle capabilities, and they deserve to be included… not lumped together in a hash that includes everything from the 1970’s til now in a handful of paragraphs. Gripes regarding recent history aside, this is something every serious bicyclist should at least flip through sooner or later. I highly doubt many people (apart from the authors) have a good grip on all of the developments mentioned in its pages, so you’re guaranteed to learn something (and probably something interesting!). At $20-something on Amazon (for a nice hardcover), it’s definitely worth picking up for the coffee table, or for the bike-themed coffee shop, or for the bike shop, or for a stocking stuffer, if Santa’s real nice and someone you know has a stocking that can accommodate a 564-page volume. I’ve been riding the On-One Fatty fatbike for a few weeks now, and I am ready to share some initial thoughts with you. I also want to clarify something before we get started. We reached out to Planet X/On-One USA for this bike primarily to test for our sister site Mtnbikeriders.com after our experiences with fatbikes in Las Vegas last September. But, we thought, “why don’t we try this bike out as a commuter, too?” While we’ve long been advocates of the “you don’t need anything special to be a bike commuter” camp, there ARE times when the right tool for the job is something a bit off the beaten path. 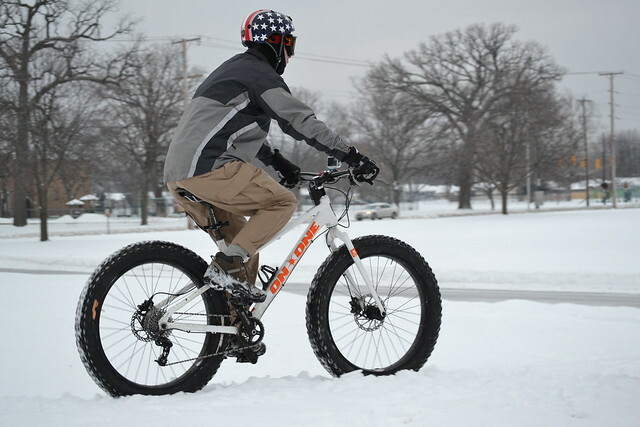 Fatbikes, as you can imagine, are definitely not a typical everyday commuter choice for the vast majority of us. As I mentioned in my introduction, there was almost no snow on the ground when the bike was delivered. I didn’t have to wait long, though, as plenty more came only days later…and proceeded to pile up every couple of days thereafter. So far, it has been a lot of fun, but there’s also been a bit of a learning curve. Think of fatbikes as an overgrown mountain bike…but one capable of tackling terrain that may leave a regular MTB spinning its wheels. 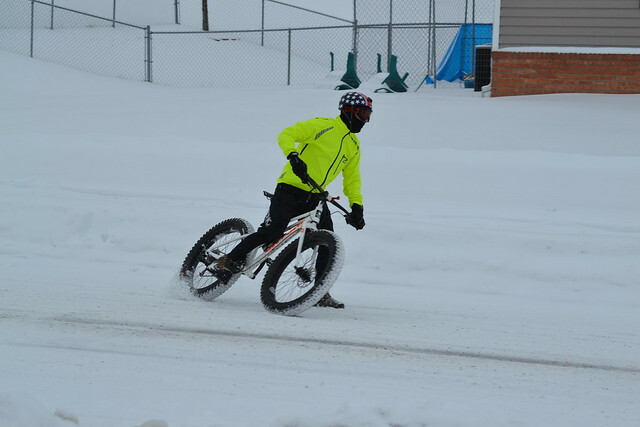 Riding a fatbike in hairy conditions isn’t always as easy as swinging a leg over and pedaling away, though, as I quickly learned. The On-One Fatty features an aluminum frame and a steel fork. I tested the 18″ frame (measured from the center of the bottom bracket to the top of the seat tube), and it fit just right (I’m about 5′ 9″). The frame is constructed with a doubled top tube and a low standover height, crucial for when you’ve got to stop in knee-deep snow. 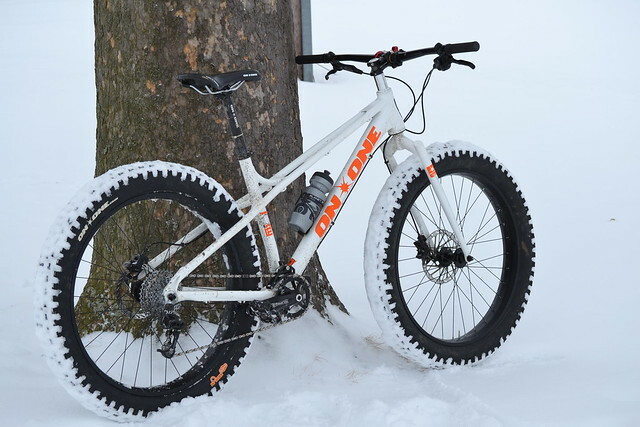 That doubled top tube and the overall construction means the Fatty is stiff from front to back; there was ZERO flex even when horsing this brute around in the white stuff. The parts spec was fine for my purposes — nothing exotic, and everything worked just the way it was supposed to. Remember that we are testing a 1×10 drivetrain, and the newest version of the Fatty comes with a 2×10 for some extra hillclimbing gearing or bailout range if things get really ugly. The Fatty did well when the snow was packed down or if it was a bit damp and heavy (snow in near-freezing conditions). It did tend to bog down in fresh, dry powder (well below freezing temps) or if the snow was saturated from melting. 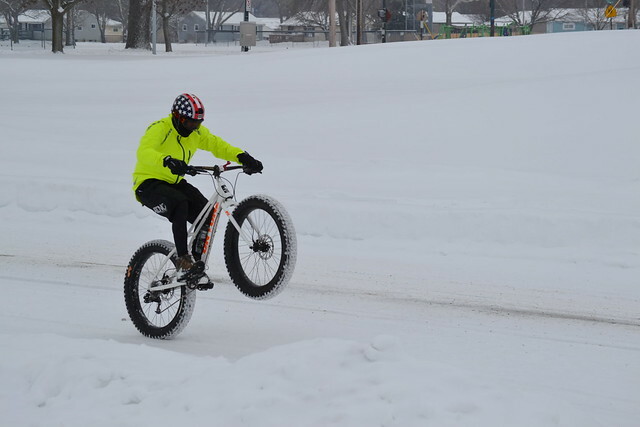 I asked my fatbike guru Chris Follmer for advice along the way, and he mentioned that generally, ALL fatbikes exhibit the same preferences for snow conditions. Some of that depends on tire tread and pressure, of course. I would like to try other tire patterns to see if some grip better in dry powder than the stock tires that come with the Fatty. I did play with pressure, though…going as low as 5 psi, but generally hovering right around 7 psi for the best balance of grip and rolling resistance. On slushy roads or soft, muddy ground, the Fatty sings right along. On dry pavement…well, you can imagine that low pressures mean a sluggish ride. On dry days, I cranked the pressure up around 15 psi to see how the ride was — while there was still a good bit of rolling resistance, I was able to knock out an 18 mile trail/road ride in short order and without too much extra effort. Even with the high pressure (relative to most fatbike uses), there’s a lot of natural suspension effect going on with the huge tire volume. Talk about smooth sailing! 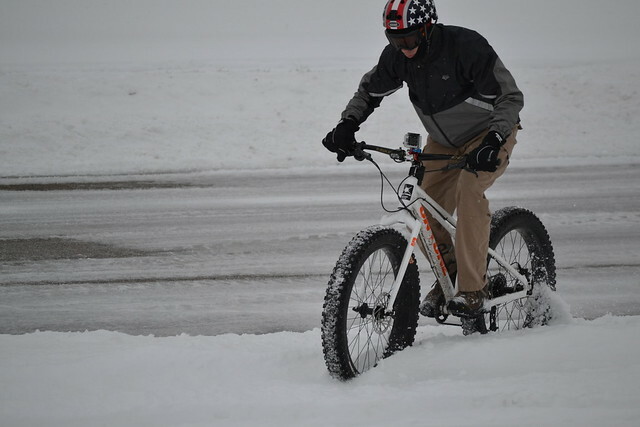 Most fatbikes come with wide handlebars…I mean, REALLY W-I-D-E bars. The El Guapo Ancho bars that came on our test Fatty measure 820mm from end to end! Wide bars are needed to help keep the front end from wallowing out in soft conditions, allowing the rider to apply lots of “body english” as needed. Learning to relax my grip on the bars took me a few rides; at first, I was clenching them pretty tightly and wandering all over the place. Once I discovered that I could track better by relaxing, I started doing that…allowing me to stay in tire ruts made by cars, or packed-down areas on the trail. In our formal review in a few weeks, we’ll talk about commuting potential and the particulars of this bike’s running gear. In the meantime, if your commute requires traversing snow, deep sand, mud, or you simply like to take shortcuts over the rough stuff, a fatbike might be just what you’ve been waiting for.